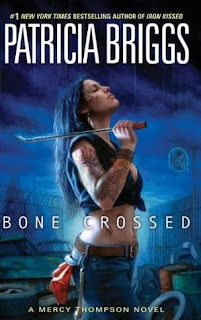 Bone Crossed is book four in the Mercy Thompson series. While the previous book wasn't my favorite in the series, this one made up for it. Mercy, our coyote shifter VW mechanic is still dealing with everything that happened in the previous installment but has the added worry that the vampires are not pleased with her. You see, a few books back, Mercy killed a vampire and the Queen didn't exactly want that to happen so she's pissed and gunning for Mercy and her friends. 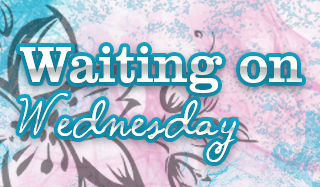 With coincidental timing, an old friend comes into Mercy's life and needs Mercy to come to her aid. She decides to hit the road to help her friend out but trouble just seems to follow her. This doesn't resolve the vampire issues she's having and Mercy with the help of her friends have to figure everything out before everyone winds up dead. Bone Crossed was a pretty solid installment to this series, I liked seeing Mercy recovering and trying to get back to her normal self. But the one thing I was extremely happy to see in this book was that Mercy chose between Adam and Samuel and sticks with her choice. The Pack dynamic will be interesting to see as the series progresses now that her choice has been made. I also enjoyed seeing a bit of all the paranormal beings I've come to love in this series. There were a few scenes with the fae, quite a few with the werewolves and the book mainly focused on the vampires. It does make me wonder what trouble Mercy will get into during the next book, so I'll have to check that one out soon. As always, if you enjoy Urban Fantasy I think you'd love this series. Glad this instalment worked so well for you! I didn't quite enjoy book 3, so if you get pissed about that one just know it does get better and keep going. Such a relief when a following book gets better. There's that fear that if one book was kind of a clunker, that the whole series might have "jumped the shark" and it's done for. But sometimes it does come back and get better. Uh huh! I knew from other people's reviews of books later in the series that they still enjoyed them. But I'm glad to see it myself! :P Uh huh!! I'm trying to work my way through it now! so good to know this one made up for the previous books!!! :D I was happy to see that it did too! This series is one of the few that the love triangle didn't bother me. I didn't feel that it was angsty or whinny about it. I also thought that Mercy made her decision pretty quickly. I agree that Mercy made the right choice.